In a food processor, pulse together the onions, celery, carrot, Gefilte fish, pepper and mayonnaise. Pulse until you have created a thick paste like mixture. Pour Gefilte mixture in bowl and then fold in gently the fresh dill and fresh chopped parsley. You might want to add some kosher salt at this point to taste. Scoop the mixture into a pastry bag fitted with a large hole tip. Lay out your lox sliced onto a cookie sheet that has been lined with wax paper. Pipe some Gefilte mousse into the middle and fold the ends of the lox together, to create your Gefilte mousse wrap. Place onto Manischewitz® Tam Tam and serve. 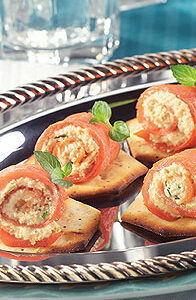 If you would like to serve this more as a plated appetizer this dish goes great with some Moroccan Beets. Mix everything together in a large bowl and serve.